(Hong Kong, 13 March 2018) Vitargent (International) Biotechnology Limited (“Vitargent”) published test results of 30 popular face cream products under 30 brands available in the market on its Test-it™ information platform (www.fishqc.com). Known for its recent nine safety examinations of cooking oil, BB cream, instant coffee, sunscreen, ice cream, lip balm, milk products, lipsticks and infant milk powder, Vitargent has applied the “transgenic medaka” and “zebrafish” embryo toxicity testing technology, which is unique in the world and developed by Hong Kong scientists. Based on the agreed scope and procedures with Vitargent, PricewaterhouseCoopers has compared the test results performed by Vitargent to the classification of tested products into green, yellow and red fish according to Test-it Standard and the numerical figures presented within the “Finding of Test-it” session in this report. The safety test rated 17 samples as Green Fish (excellent), 1 sample as Yellow Fish (basic) and 12 samples as Red Fish (sub-optimal). Multiple samples contained international prohibited and restricted ingredients, carcinogenic ingredients and xenoestrogenic ingredients. Various international studies had proven that xenoestrogens are easily absorbed by the human body, found in breast milk, breast tissue, cord blood and even placenta, threatening the health of the next generation. Vitargent suggests the public to pay extra attention to the ingredient labels upon choosing face creams for consumption. It is advised to choose products with basic functionality and less preservatives, sunscreen, spices or alcohol. Wrinkles, dry skin and skin scraping could result from ageing and seasonal changes. Applying decent amount of face cream moisturises and protects the skin. Apart from brand preferences, skin type and price, some consumers make their face cream choices based on the special features listed on the ingredient labels. For example: skin tightening, moisturizing, whitening, antioxidants, anti-inflammatory, allergy relief and sunscreen. However, the public may overlook the risk of health threats from the special features chemicals. 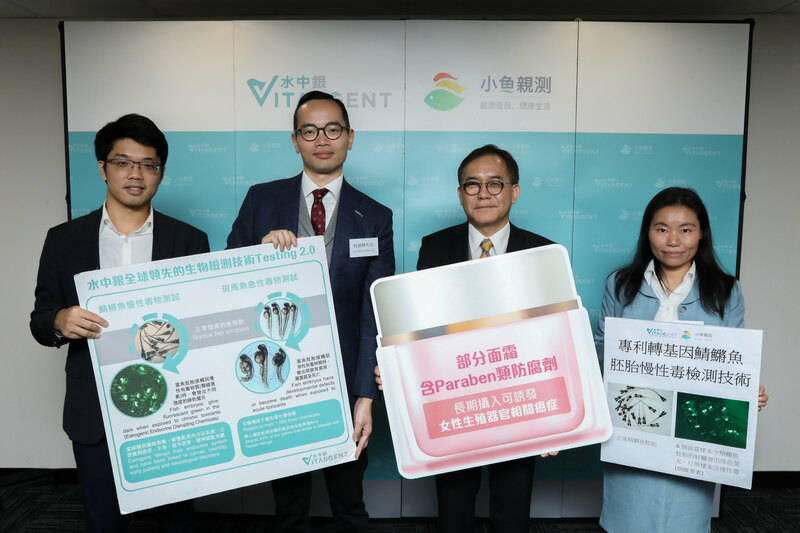 From July to August 2017, Vitargent collected 30 samples from 30 brands for toxicity tests from local Watsons, cosmetic counters and online platforms (Joyby, Tmall). The brands included SK-II、Estee Lauder、Laneige，FANCL. ➢ Red Fish means “Sub-Optimal” in terms of safety, indicating a product is below standard in one or more criteria in the screening of acute toxicity, chronic toxicity and banned ingredients. Consumers are recommended to purchase with extra caution. Among the 30 samples, Test-it™ rated 17 samples as Green Fish (Excellent), 1 sample as Yellow Fish (Basic) and 12 samples as Red Fish (Sub-optimal). In terms of price, the average price of the 30 samples purchased was 6.3HKD/g. The most expensive one costed 50HKD/g, which was nearly 500 times of the cheapest one which costed 0.1HKD/g. Among the 10 samples that costed less than 2.7HKD/g, 4 (40%) samples were rated Green Fish, 6 (60%) were rated Red Fish. Among the 10 samples that costed between 2.7HKD/g and 5.8HKD/g, 8 samples (80%) were rated Green Fish, 2 (20%) were rated Red Fish. Among the 10 samples costed more than 5.8HKD/g, 5 samples (50%) were rated Green Fish, 1 (10%) was rated Yellow Fish and 4 (40%) were rated Red Fish. In conclusion, the safety of the mid-priced samples was relatively higher than low-priced and high-priced samples, with nearly 80% samples rated as Green Fish. Low-priced and high-priced samples rate of Red Fish are 60% and 40% respectively. The public are suggested to purchase with caution. Among the 15 samples of Asian brands (China, Japan and Korea), 12(80%) of them were rated Green Fish, 3 (20%) were rated Red Fish. Among the 6 samples of European brands (France, UK) 3 (50%) were rated Green Fish while 3 (50%) were rated Red Fish. Among the 7 samples of American brands (US), 2 (29%) were rated Green Fish, 5 (71%) were rated Red Fish. Among the 2 samples of Oceania (Australia, New Zealand) 1 (50%) was rated Yellow Fish and 1 (50%) was rated Red Fish. As to the place of production, face cream produced in Asia, Europe, America and Oceania were tested. Among the 30 sample, 18 samples were manufactured in Asia (China, Japan, Korea and Indonesia). 12 were rated Green Fish (67%), 6 (33%) were rated Red Fish. For the 5 samples produced in Europe (France, UK), 3 were rated Green Fish (60%) while 2 were rated Red Fish. (40%) Among the 5 samples manufactured in America(US), 2 samples (40%) were rated Green Fish, 3 (60%) were rated Red Fish. 2 samples were produced in Oceana (Australia, New Zealand). 1 (50%) was rated Yellow Fish and 1 (50%) was rated Red Fish. In conclusion of brand origins and production comparison, due to the insignificant amount of samples from a certain regions, the result does not reflect the differences between the two. However, Asian and European samples showed a well-balanced overall performance. It is a good sign for the public. Vitargent’s Chief Executive Officer Jimmy Tao said, “Zebrafish embryo and transgenic medaka embryo were used in the acute toxicants and chronic toxicants tests of face cream samples. In the zebrafish embryo test for acute toxicants, 2 samples failed the toxicity test. Our team observed under the microscope that, when zebrafish embryos are exposed to acute toxicants in face cream samples, they developed abnormally and suffered from blood clotting disorders, heart swelling and even death. As 84% of genes known to be associated with human diseases have a zebrafish counterpart, substances which are harmful to zebrafish may also be harmful to human. The process of zebrafish development imitates that of human’s. One day of zebrafish embryo development is equivalent to 12 weeks of fetus development (3 months). Their tissues and organs including heart, bones, glands and kidney functions and reacts biologically identical to humans. Thus any toxicant that harms a zebrafish would pose the same health threat to a human being. Jimmy Tao pointed out that the current regulation of cosmetics, skin care products and slimming health food in Hong Kong is underdeveloped. New amendments are already made in other countries to regulate Paraben preservatives. Denmark became the first to ban Paraben preservatives in children products since 2012. According to EU’s cosmetic regulations EC1223/2009 and China’s cosmetic safety regulations, 5 Paraben preservatives were banned since year 2014 and 2015. The preservatives included Isopropylparaben, Isobutylparaben, Phenylparaben, Benzylparaben and Pentylparaben. Currently, Propylparaben and Methylparabena are the most commonly used paraben preservatives. The public can make smart choices by carefully examining the ingredient labels. On one more note, allergen (6 samples) and wax (3 samples) were found in the face cream samples. Eugenol Eugenol, Coumarin, hydroxycitronellal, Geraniol, Citronellol, Benzyl Alcohol, D-limonene limonene are known allergens for fragrance enhancement which lead to skin allergy, itch and pigmented cosmetic dermatitis. Wax including Petroleum jelly and petrolatum are low cost and common moisturizers, however they are ineffective in terms of locking in the moisture. Compared to other skin tissues, lips are more sensitive to allergies. Dermatologist Dr. Hui Shiu Kee indicates that the commonly known estrogen mainly refers to the hormones from the female ovaries. Apart from natural secretion, many chemicals including Paraben preservatives and chemical sunscreens share similar chemical structure with estrogen. Once inside the human body, they imitate estrogen and similarly affects organs and tissues. These chemicals are known as “xenoestrogens”. There are a lot of estrogen receptors on the skin. External intake of xenoestrogens could lead to hyperpiasia, making the skin more moisturised and elastic. However, they come with long lasting side effects. Chronic consumption could lead to cancers including breast cancer, ovarian cancer, prostate cancer, reduction in reproduction ability, and increased chances of stroke. Furthermore, pregnant women, infants and teenagers going through puberty are most affected by endocrine disruptors (i.e. xenoestrogens). They may lead to disruption in endocrine, physiological imbalance, obesity and precocious puberty. Women may also suffer menstruation disruption as a cause. World Health Organization had listed estrogen as group 1 carcinogen. Dr Hui said that estrogen enter the body through oral intake or external use. Patients undergoing treatments with estrogen should follow doctors’ instructions for the correct amount of intake. Dr Hui explained that the main function of face creams is to act as a natural barrier for the skin. It forms a thin mask over the skin surface, reduces water loss and helps moisturising. A good face cream must contain the functions of moisturising and softening. Moisturisers help absorbing water deep into the dermis. The most common ones are propylene glycol, glycerin and butylene glycol. Softeners are usually added into face creams to smoothen the skin surface to make it soft and elastic. The most common ones are jojoba oil or was. Furthermore, some face creams contain natural or compound preservatives. To a certain extent, preservatives protects the product as they prolong bacteria growth or spoiling from chemical changes. However, there are good and bad preservatives. The public should recognise toxic preservatives (i.e. Paraben) and pay attention to ingredient labels on the face creams. Be alert about the major ingredients on the top (represents high percentage in the formula), prevent additives including fragrances, alcohol, alcohol dent etc, and choose products fit for their own skin type. Dr Hui reminded the public that face creams with stimulants including spices, alcohol, preservatives or sunscreens are not suitable for skins with allergy or eczema. To sample a new face cream brand, first apply on the back of the hand or on the soft skin of the inner forearm. Then, let it sit for 30 minutes. If it does not cause allergy reactions, rashes or burning, it is safe to use. Furthermore, some parents moisturise their children’s faces with adult face creams. Since children’s skin is more sensitive, the spices and preservatives in adult face creams may lead to allergic reactions, eczema or contact dermatitis. Parents should avoid applying adult face creams on their children and apply children face creams with simple ingredients. In general, twice a day is adequate for skin treatment. However, the high humidity in Hong Kong might lead to high face cream loss rate. Apply more face creams in case of excessive sweating, extra dry circumstances and partaking water sports. Do not excessively apply or it will clog the pores. EC No .358/2014. Commission Regulation (EU) No 358/2014 of 9 April 2014 amending Annexes II and V to Regulation (EC) No 1223/2009 of the European Parliament and of the Council on cosmetic products. USFDA, Status of color additives. December 2015. Journal of Applied Toxicology. 2012, 32(3):219-232.